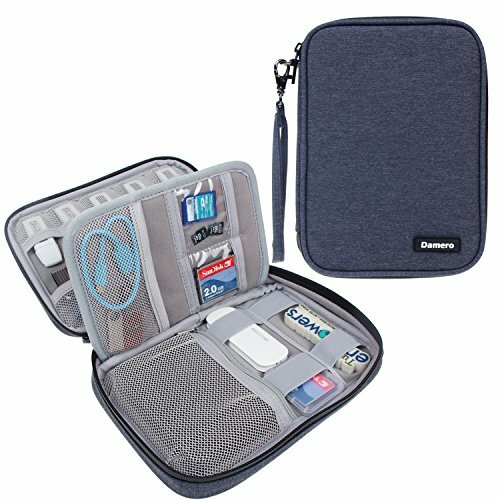 Damero USB Flash Drive Bag for SD Cards, Power Banks, Memory Cards/Waterproof External Hard Drive Case (Large, Dark Blue) by Damero at Pacs BG. MPN: CADM04102. Hurry! Limited time offer. Offer valid only while supplies last. Excellent Protection- Interior padded cushion protects your External hard drive from bumps, scratches and dents. Keep wires, memory sticks, SD cards, pen drive, CF cards organized and visible. A insert with elastic straps offers added spaces for small items. Easy access mesh pockets expand to store multiple size USB drives. Comes with a detachable hand-strap. Handy size. Can fit in any suitcase, backpack or a laptop bag. If you have any questions about this product by Damero, contact us by completing and submitting the form below. If you are looking for a specif part number, please include it with your message.